Many of them also later testified at a public comment period inside the building to to voice their opposition against the Trump Administration’s proposal to “maximize water deliveries” to the federal Central Valley Project. In fact, every single one of the 15 people that spoke at the meeting testified against the increased exports plan. A large number of project opponents arrived in the federal building late because they had wait in a long line as they proceeded through Homeland Security. I personally spent 30 minutes in line as the security checked I.D.s. and ran our belongings through the security cameras. The Yurok Tribe , California’s largest tribe, faced a subsistence allocation of just one fish per eight Tribal members, due to the Klamath River having the worst salmon run in history last year. He wore a red hat with “Make America Sacred Again,” a play on the Trump campaign’s hat, “Make America Great Again,” and discussed the Tribe’s current efforts to return the fish, now thriving in New Zealand on the Rakaira River, to the fishery to the river above the dam. 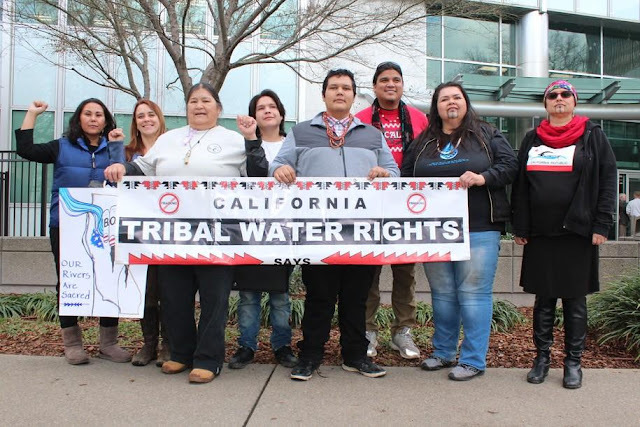 Morning Star Gali, Pit River Tribal Member, spoke on the devastating impact of the building of Shasta Dam and other dams on her tribe, which subsisted on salmon for many thousands of years before colonization. “We need our salmon returned,” she said. The Delta smelt could be the first fish to to become extinct in the wild in the U.S. since President Nixon signed the landmark Endangered Species Act (ESA) in 1973. Maligned by the water contractors as a “little minnow,” the smelt is in fact an indicator species that demonstrates the health of the San Francisco Bay-Delta Estuary. Other speakers at the rally included John McManus, the Executive Director of the Golden Gate Salmon Association; Thomas Joseph, a member of the Hoopa Valley Tribe; and Roger Mammon, President of the California Striped Bass Association, West Delta Chapter, and Secretary of the Board of Directors of Restore the Delta. In addition to the Sacramento meeting, a meeting on the plan was also held in Los Banos the night before and in Chico two days later. The overwhelming majority of people who spoke in the two meetings, including many farmers, spoke in opposition to it. No Comment to " Tribes, Fishermen Slam Trump Plan to Export More Water From The Delta "